This is great info Mike. Thanks to you and the rest of the BOD for taking the time to test these motors. Could also have winter tires on it. I see you're driving one of our Mt. Rushmore's favorite car's today! Thanks for sharing your detailed evaluation of the motors with the crew here. "Mt. Rushmore of Slot Racing Douc... nevermind... inside joke, with KVP, and myself. No, fairly new, Michelin Pilot Sports. I have that car today because it 's going to hit almost 50 today, and I drive it whenever I can in the winter to keep the seals moist. I see your tire gauge doesn't like the cold either or you need air LOL. It's been flaky for about five years. It goes on and off, for zero rhyme or reason. Just not a priority to fix, for a poor raceway owner. I've tested one motor in a Retro Can-Am. I'm going to try to get to a second motor tested, before I post anything. May be a while. Just missed a call from a slot car distributor, probably wanting to know where his order is. LOL. Enough of this jibber jabber. Some of us are hitting the refresh button with bated breath looking for the next episode of "Motor Expo." In post #17 it looks like those arms have clear epoxy over the balance marks, is that so? If so then that's new and wouldn't it affect the balance somewhat? Do these motors have open can and endbell bushings? That would be better than the current shielded endbell bushings because it allows more precise oiling and prevents over-oiling when you're sure enough of the oil is getting to the bushing. We need a live feed of the King. They are identical to the Hawk Retro. I took one apart and the only difference was the arms that hold the brushes they are much larger (wider) and appear stronger then the ones in the Hawk Retro. As someone noted the balancing may differ on some. If the speed-crazed morons are looking for a motor that is going to be faster then the Hawk Retro, they will not be happy. I do think Professor Motor tried to address the shortcomings of the brush arm; not the brushes themselves, but the arms holding the brushes. A simple fix that I hope JK will adopt for the Hawk Retros intended for IRRA® use. I took one apart and the only difference was the arms that hold the brushes they are much larger (wider) and appear stronger then the ones in the Hawk Retro. When Andy emailed me with his interest in submitting his motor, he made reference to "some internal improvements." When I took apart the one motor, at the same time as the new 7R, I looked long and hard to see if there were any differences. I only spotted the thin steel spacer, on the end, vs. the plastic one, and the missing plastic one, on the other end. The brush arms, appeared to be the same, in both motors. I just ripped them out of both motors. The pic of both sets are below, with the PM endbell, on the left, marked. I still believe they are identical. Please feel free to post anything, you might have, with wider arms. If they, indeed, have wider arms, and the motor I took apart is an anomaly, that particular situation, wouldn't be a deal-breaker, for me, for my 20% approval. Anyway, I've gotten new two PM motors, fairly well tested, comparing it to my Sano 11 podium, GTC hand-out, 7R motor, in my two-time winner, six-time podium (and 1-4th - thanks, Raisin) "World's Most Beautiful Retro Chassis." Lots of detailed, interesting stuff, but I have to shift back to Chicagoland Raceway, small slot car manufacturer, mode. I should get my results posted tonight. Any way to test the arm tension with a fiddle stick? Maybe the PM arm is stiffer or lighter? The motor I compared the PM brush arms to was a worn out old Ink stamped motor from the first batch. I have not taken apart a 7R yet. I do have one dud 7R I will compare the PM to that one. I didn't have time to answer your post earlier. 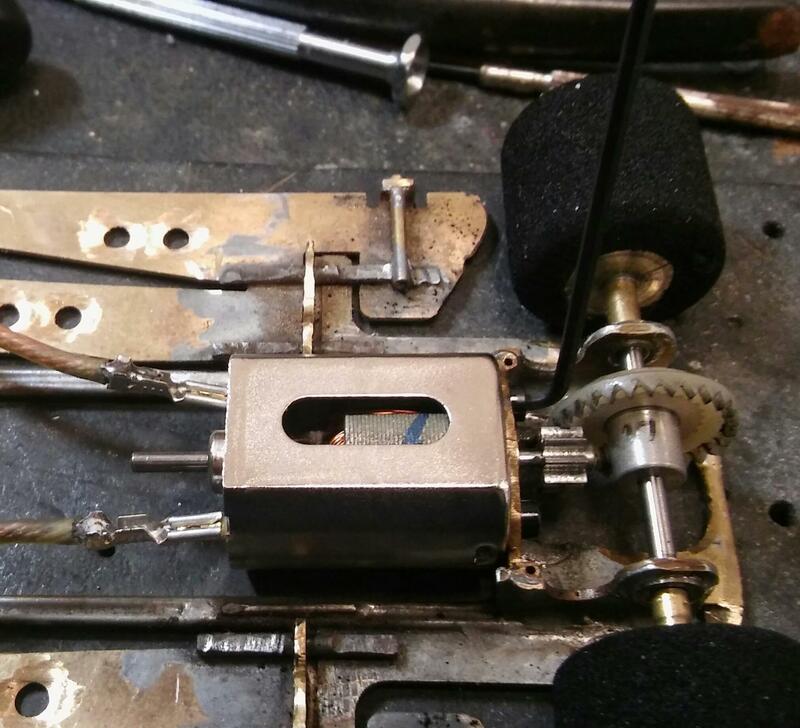 Before seeing GVP's follow-up post, my answer to you was going to be "It's not very scientific, or precise, but I "twanged" on the arms, of both motors, with a jeweler's screwdriver, and they seemed pretty identical." Reading GVP's new post, I was probably correct. LOL. Noose PM'd me right away with the theory it might have been a non-7R you were comparing it to. I've been up since 4, so that possibility sailed right over by head. I can check some earlier motors, later tonight. I don't throw out much of anything, when it comes to motors. You never know when we'll have an apocolypse. If John Havilcek is spared, we might still be able to have Sano 38. Anyway, you may have come up with the reason the 7Rs have more brakes, and can pull more gear, than the older motors. On to this. It will be in steps. As mentioned before, I dry broke in 2 motors, yesterday. I had plenty of time, a couple of power supplies, no advance knowledge of the hardness of the brushes. I didn't keep exact track of the time, but it was 6-8 hours, at 6V. During that time, Tony and Noose were breaking in theirs, and confirmed by PM that the brushes seemed to hard, and needed water or Simple Green break-in. Despite that I continued, dry because there was less of a chance of me doing something stupid. I reoiled every couple hours. On the comm end, I just touch the arm shaft, near the bushing, with the side of the needle and the residue on it , and let capillary action perform. I barely squeeze the oil bottle, with the axle bb's, and the can bushing, and I never squeeze it, when on the comm end. Well, just like the Sano GTC Pro race, with my 7R handout, I was woefully under broke in. I ran the motor in my 3rd place Coupe chassis, and Can-Am Fiedler Flat Track winning Can-Am car. That chassis ran 1,2,4 the year before, at Sano 10, in GTC-Pro, C/A Flat, and C/A King, and qualified 1,1,3. But for Sano 11, I decided to cut out one of the .055" wire rails, and replace it with an .062" bronze one. I also lightened the car up a bit. That change worked fine in GTC, great on the Fiedler Flat, but sucked in CanAm, with the higher downforce C/A body and sticky Sunday conditions. That all said, the point of all the above minutia, is, IMO, on the way, way less sticky conditions, this morning, and early afternoon my spongier, 2.0 version, with the C/A body, wasn't really a handicap. I knew there was zero way, I would go real fast, because I knew I wasn't going to be able to run "Sano hard" tires. I went with Alpha soft wonder, and it was a good choice. The car was a bit loose early on, but I added some spray, and I was able to get around real well. The car happened to have the Sano 11, #1135, 7R handout, I ran on Friday, in GTC-Pro, and finished a decent 3rd, running the fastest race laps on Purple and Black. I hot lapped it until I felt I wasn't going to get any faster. I turned a 4.57, which I thought was terrific for conditions, but that was the only 4.5. It ran mostly mid 4.6's - low 4.7's. I took it out and put in the first PM motor. Just like that 7R handout, on Sano Friday, that I thought I could run with just a dry break-in, I was woefully "underbroken in". It took quite a bit of hard running to get PM Test Motor #1, up to speed. Once I did, it ran a best time of 4.55, a bit better than the 7R's best time. But it ran other 4.5's, and way more low 4.6's. Of course, it also ran more laps, and on, more broken in tires. The above all considered, I would call it a draw vs. the 7R, or possibly a slight "win ", for the 7R. Before I took out #1, I set up the computer, in race mode, and ran a 2 minute heat. I drove pretty conservatively, as I wanted to run a perfect heat. As I expected, I ran 26 laps. I ran a best lap of 4.605, and noted it was done on the 16th lap of the heat. I ran a last lap of 4.630. For the heck of it, I installed my C/R FK motor clips, on the existing lead wires and used them, to avoid heating up those terminals. Not sure if it made a difference, but it couldn't hurt, and the 2nd motor ran well. I continued with running the car, as I finished with the first motor, in race mode, running 8 heats in a row , on Blue lane. On the sheet, I'll post below, there are heats with low totals, from falling off, or getting back to the panel late, from PM'ing Tony and Noose with the info. Motor #2 was not fully broken in either, but it came in steadily throughout the simulated race, with a new fast time, turned each subsequent heat but one, and that was very close. The main thing while running, after noticing I ran my fast lap, 2/3rds of the way through the heat, with the first motor, I made note of what lap of the heat, I ran fast time. It was always deep into the heat, but as the "race" wore on, the early lap times got much closer, to the fast time of the heat. Most impressive was the last heat, with running a 4.611, the 2nd lap, which held up until late in the heat, when I finished with a bunch of 4.5's and 4.60's. I would rate this motor as better than the Sano podium 7R motor run earlier, but not by a ton. It will also be interesting, when I go back to running it, if it will continue to improve. By all indication, these motors are a direct copy of the 7R, with just very minor differences, and probably made in the same factory. Unfortunately, that seems to include the hard brushes, racers are tired of working so hard, getting fully broken in. And those hard brushes might also mean we will see some "unique" operating PM motors. Of course I would prefer it wasn't the case, but if there is some of those, I would not see that as a reason to not approve the motor, as we haven't unapproved the 7R, with it's numerous complaints from racers, the last 6-12 months. And I did send in to Tim, at JK, earlier today, the flaky running 7R motor, that was instantly "fixed" , by installing an R endbell, along with the questionable 7R endbell. As far as the performance, the two I tested, were certainly an "approveable" speed, with room to spare, before they approach the speed, of the fastest HR's, I've ever seen, run on my King. If I test the other two, without soiling my underwear, I would certainly give my 1/5 vote, for approval. My Jerry Brady'esque chassis, with #2 PM Test Motor, 9-27 gearing, Alpha soft Wonder tires, and C/R FK motor clips. 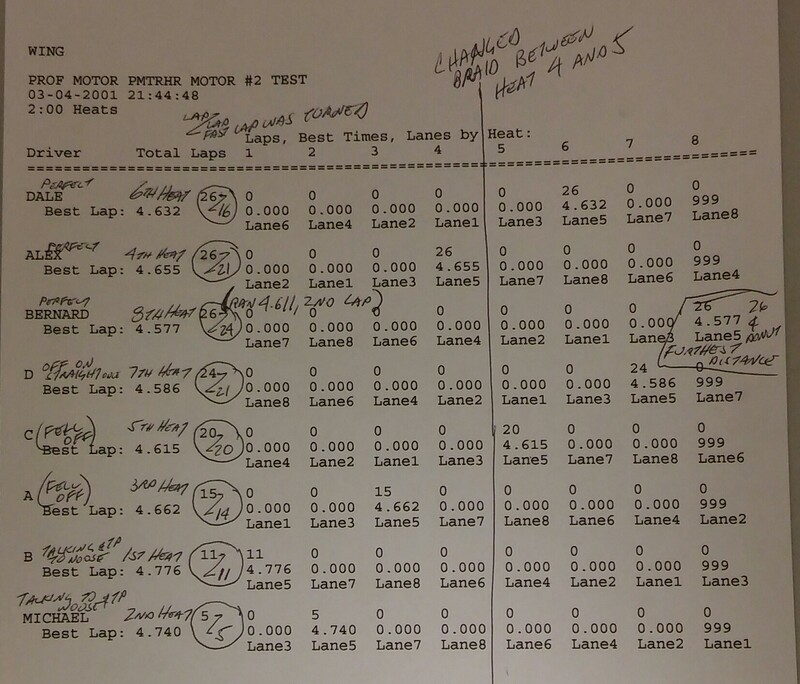 The lap #, the fast lap was turned, is under the total laps for heat. I took apart a couple old, ink-stamped ones, and the brush arms/springs look and measure the same as the current 7R/PM motors. Anyway Mike's House of Sarcasm & Endbell Transplants is closed for the rest of the weekend. I'll try to check out those 2 other motors next week. You can do that with a piano tension gauge - a lot of t=jet (HO) racers use them to set the tension on the shoes. Mike do you know if any other of the board members have tested their motors yet? Yes, I think 3 of the the other 4 BOD have gotten them on the track in the last few days. I'll let them comment about them, if they wish. Here is a good question for everybody. What do you consider as being a "completely broken in motor brush"? I usually like to break in the brushes until I get a full wipe on the commutator; then go to the track. However, at this point, the brush is not fully seated on the comm. You might have to get the brushes 50% worn before the full footprint of the brushes are in contact with the commutator. Tony gave me two of his 5. I broke them in using water. These motor brushes in the PM motors seem to be just as hard as the 7R brushes. I tested them on Tuesday night at P1 Raceway in Winter Garden, Fl. This track testing used a heavy flexi-car that handled great and weighed 102 grams, close to the weight of a Can-Am car. Thursday night, Tony and I will be testing all 5 motors in a TonyP Can-Am chassis. Details as Tony can publish them. I am with you, Doc. With the hard brushes trying to get a brush full face on the comm is about ridiculous. I try to get what starts out as the flat side of the brush next to the winding connections seated to match the curve of the comm. At that point you will have contact all the way across the comm but will still have the original wrong way arch in the brush sides lengthwise of the comm. I figure this gives me brush contact with the comm for as much of the rotation as I am going to get. Why don't you test these motors in a wing car chassis? Put a rubber band on the controller and set an alarm every 30 minutes to record data. Take the driving out of the equation and free up your time. ...ummm... Because the IRRA® is a Retro racing organization. I figure this gives me brush contact with the comm for as much or the rotation as I am going to get. if the motor has hard brushes I would assume it's just like a new Hawk 7R; don't bother with it, just throw it in the trash. I thought the IRRA® had a "motor guy" to check out motors. What happened there? Sorry state of affairs when the racer has to scramble to look for old motors in an organization that prides itself on motor parity. I know you guys are trying but, come on, you need to find a motor that is consistent from one batch to the next. If you can't do that then ban all old motors when the supplier gets a new batch in. Sorry for the guys that hoard motors. Pretty obvious you haven't been paying close attention, Gil.